It's The Perfect Gift And Greeting All In One! Hand-dipped in fine White Belgian Callebaut® Covertures Chocolate and embellished with edible Raphael Cherubs and White Pariels and Heart Sprinkles, your personalized message goes on the foot-long fortune inside! Tell them how "fortune"-ate you are to have them in your life...or that he/she's your sweetest cookie and greatest fortune! You'll make their heart crumble! 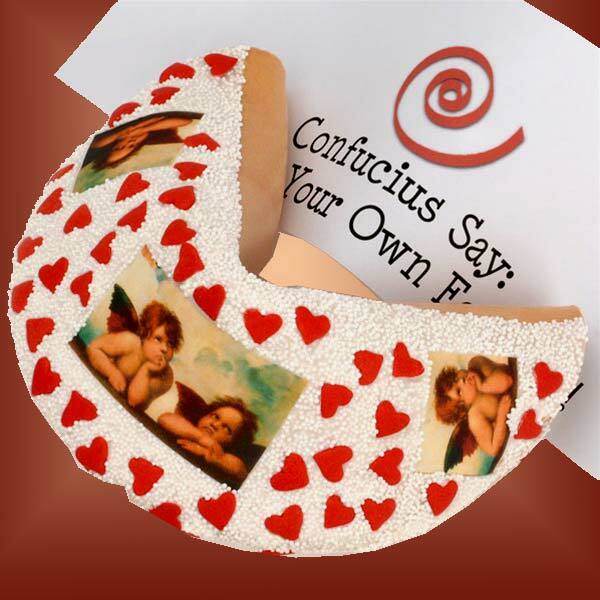 Your personalized message goes on the 1-ft-long Fortune inside making this a perfect way to send Good Fortune for any occasion! Each masterpiece cookie is hand wrapped in a clear cello bag and tied with a lovely ribbon. We hand-pack each cookie in our 7" x 7" x 7" Glossy White Gift Boxes and top with matching Tissue Paper.